brings smells of summer night my way. of the lightning bugs arise. lime yellow lights are upon. and out into the dark field it goes. these little fairies of the night. as Flicker, Glimmer and Glow. I wrote four stanzas of non rhyming lines in my journal last night after looking out my window at the lightning bugs. But I did keep a pace to it or rhythm. I always wish to paint a scene with Lightning Bugs but think it’d be rather hard, how would I do it? I guess when I look out at the Lightning Bugs I feel a sort of longing, just like looking at the moon when I’m alone. So the poem, as I developed it above, has a feel of longing for childhood, magical memories. It might have been different if I wasn’t looking at them alone. Also I introduced the names Flicker, Glimmer and Glow. As I wrote the poem I thought of them and how I could create characters of a more light and delightful kind to write a story about. I’m sharing the poem because I’d really like some feedback. If you could read it aloud, especially to children, and see how it feels? Sounds? When I wrote it I meant for it to be read slowly, deliberately, quietly. This lends to a more somber mood though and I wonder would children find it peaceful? Would they prefer it read more lively? I’d love some feedback, please leave comments! This is a sketch I did the other day while out walking in my field, I posted on my website blog about it here. 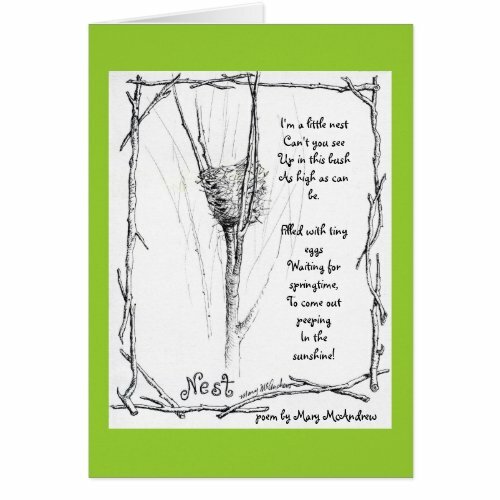 After I created a card for it and wrote a poem, inspired by this drawing of a birds nest. Please click to see it in my shop, you can add whatever words you want inside and change the color on the front!